In my previous post, I shared with you on How To Add and Verify Your Blogger Blog In Google Webmaster Tools in other to Get traffic from Google, which is a good example of SEO (search engine optimization). Today, I have another interesting and important post that will help you to boost your website, blog or web page, free of charge of charge. August 2010, MICROSOFT and YAHOO signed a deal to become partners instead of competitors in their DOMAIN SEARCHING. Hence, they became a New ALLIANCE in searching. The Important point of the deal is that BING (Owned by MICROSOFT) will be the search engine behind YAHOO. Lets proceed on the steps of Submitting your Blog to BING. 1. Go to the Official BING WEBMASTER TOOLS WEBSITE Here and Log In with your MICROSOFT account. If you don't have one, just create one by clicking SIGN UP and Log In with that details. 2. Now, Click on ADD A SITE option from the List of options that appear on the Left Hand Side of the Window (Depicted in the Below Image). 3. Next Step, Type your BLOG NAME in the space provided. 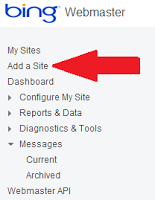 If you have created a SITEMAP to your Blog, then type its URL in its Space (Remember, It is just optional and you can add a SITEMAP anytime later), and Select an option from the Drop Down List Box for the Time when you receive most Traffic in a Day. Then, Click On ADD Button on Completion of the Typing. 4. Now, BING will ask you to verify the ownership of your BLOG. To do this, See the OPTION 2 available and copy the META TAG (See the Image below as where your META TAG will be available) of your Blog. 5. Copy the META TAG and Paste it in your Blog's Homepage as you did in case of GOOGLE WEBMASTERTOOLS HERE and SAVE the TEMPLATE. 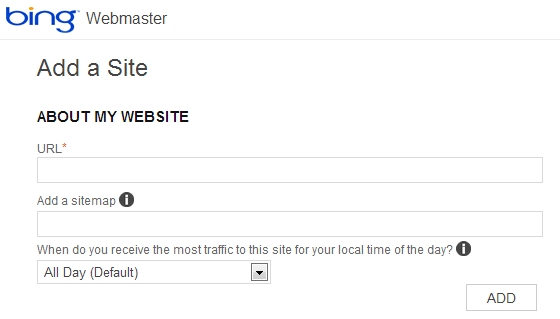 Then, Return to BING WEBMASTER TOOLS and Click on the VERIFY Button. 6. Congratulations, you are done with SUBMITTING YOUR BLOG TO BING AND YAHOO. NOTE: Once you have submitted your blog to bing, it means you have always submitted your blog to yahoo too. Also, just submitting the Blog to Search Engines does not matter. You need to PING (Update) your posts to these search engines as and when it is created. Related Post: How To Add and Verify Your Blogger Blog In Google Webmaster Tools | Get Traffic From Google. I hope you successfully added and Verified Your Blogger Blog in Bing and Yahoo Webmaster Tools in other to get traffic from Bing and yahoo. If you feel any difficulty or you have for any suggestions please use comment box. Please let me know how you get on. Good luck!